The industrious yet short-sighted Seismic Asphalt & Paving Company -- located in the sleepy town of San Andreas, California -- has put you in charge of one of its many road crews. Your job is to build a network of roadways around San Andreas proper. But San Andreas is rather prone to earthquakes, which have a tendency to destroy the beautiful stretches of pavement you've been laying. After all the asphalt is put down, which road crew will end up connecting the most highway in between quakes? 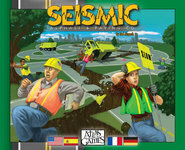 In Seismic, players place hexagonal highway tiles to build long, complete sections of highways, scoring points for each tile as well as bonus points for the ending "intersection" tiles in their routes. Scores aren't tallied until the end of the game, because at any time, earthquakes can occur, destroying tiles along the most-built direction leading out from the central "San Andreas" tile. Players constantly need to be claiming as many long roadways as possible while ensuring that their highways aren't the ones that are going to be destroyed if and when an earthquake occurs.